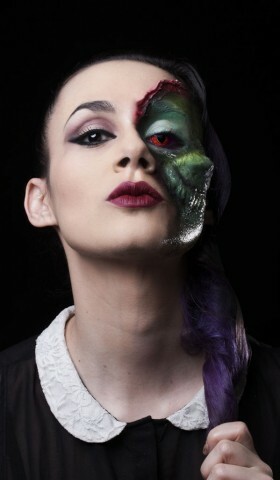 V: The Final Battle Alien Makeup « Adafruit Industries – Makers, hackers, artists, designers and engineers! Using liquid latex, modelling clay and tissue paper make the shape of the cheek piece and paint it a skin color using acrylic paint. The piece needs too have a rugged texture and be completely dry before painting and the first layer of green painting which is meant to be done when it´s placed on the skin. You must use grease paint makeup and seal it with loose makeup on some parts. The deeper or shallower parts has to be painted with reddish or brown colours to add depth. Once it´s set on the cheek, proceed to paint details using more acrylic painting and then paint the rest of the side of the face using creamy makeup and set with loose pigments. 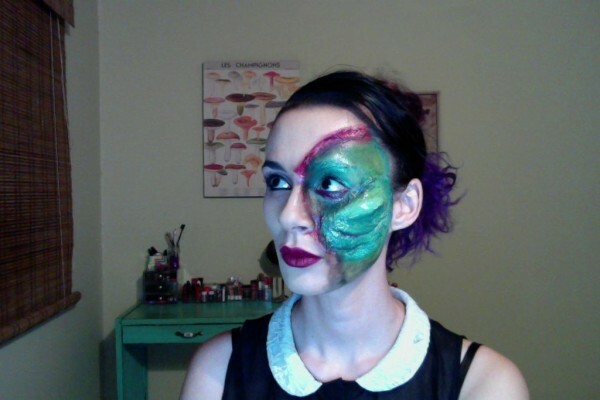 When the piece is painted completely and it looks blended with the rest of the makeup; you can use one cosmetic lens to enhance the makeup effect of the lizard side. Since I didn´t wanted the piece to look flat I did a “torn” texture on the extremes of the makeup using liquid latex and tissue paper and then pained the whole thing and added fake blood. To make the skin look wet I used glycerine on top and vaseline on some parts. The other side of the face was made using regular makeup and I wanted this part to look glamorous and beautiful so the effect of the lizard part would look more shocking.